The United Arab Emirates (UAE), created in 1971, is a federation of seven former Trucial States situated in the southernmost part of the Arabian Gulf. The topography of the UAE is characterised by rapid changes between the sand and gravel desert which dominates most of the south and west of the country (and extends inland to the high dune systems of the Empty Quarter, or Rub al Khali, of Arabia), a gravel savannah plain (with Acacia tortilis) of varying width abutting the western side of the Hajar Mountains, and the arid, jagged and shattered Hajar Mountains themselves, which rise rapidly to over 1,300 metres, and then, once over the watershed, steeply down to the coast of the Gulf of Oman/Arabian Sea.The Gulf coast is extraordinarily shallow and gently shelving with numerous inshore and nearshore islands. The Arabian Gulf is a staging and wintering area of considerable importance on a major Eurasian-African flyway for shorebirds and some other groups of waterfowl. In the UAE, there are internationally important seabird colonies, namely of Socotra Cormorant Phalacrocorax nigrogularis, Sooty Gull Larus hemprichii, Great Crested Tern Sterna bergii, Lesser Crested Tern S. bengalensis, White-cheeked Tern S. repressa and Bridled Tern S. anaethetus, and smaller but nonetheless important numbers of other species such as Western Reef Heron Egretta gularis, Osprey Pandion haliaetus and Crab Plover Dromas ardeola. The bulk of the world population of Socotra Cormorants breeds between the UAE and eastern Saudi Arabia. Despite being envisaged as an entirely desert state by many who have never visited the region, the UAE does, in fact, possess a wide variety of habitats including a range of wetland types. 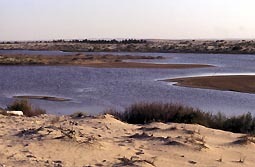 Permanent wetlands are naturally scarce inland, although ephemeral rain-fed freshwater pools and flashes often appear, even if not usually remaining for long. The distribution of many species and groups, including even birds, have yet to be accurately and comprehensively mapped in the UAE, and considerable sub speciation seems likely. This is likely to be especially true of the flora and fauna inhabiting wetlands in isolated wadis. Occasionally a wetland is created for ornamental or landscaping purposes or even, more rarely, primarily for wildlife. The construction of dams in the mountains of Fujairah, the Sharjah East Coast enclaves and Ras al Khaimah have been large-scale civil engineering works that now require an unlikely amount of rainfall to fill, although the primary purpose of some such dams is for flood control and prevention. All other wetlands in the UAE are saline or brackish. The “Sabkha” coastline, lying principally within Abu Dhabi Emirate, is recognised as being the best developed and largest example of this geomorphological landform anywhere in the world. Seven particular islands or island groups hold the bulk of the UAE's breeding seabirds. Cumulatively, the islands of the UAE hold respectively over 25% and 40% of the Arabian Gulf populations of Great Crested Tern Sterna bergii and Lesser Crested Tern S. bengalensis, about 5% of the world population of White-cheeked Tern S. repressa and over 30% of the regional population of Bridled Tern S. anaethetus. The UAE colonies of Socotra Cormorant Phalacrocorax nigrogularis are especially noteworthy. Despite having a larger breeding population than any other seabird in the Gulf, this species is restricted to only 12-14 colonies worldwide, seven of which survive in the UAE. Amongst visiting waterfowl, no fewer than 25 species, and possibly several more, are recognised as occurring in regionally important numbers either on migration or in winter. Other species or groups of species which are of outstanding conservation value due to their present rarity, or to the still sizeable populations surviving in the UAE, include Green and Hawksbill Turtles Chelonia mydas and Eretmochelys imbricata, Dugong Dugong dugon, some marine fishes e.g. Scaridae, Labridae, Acanthuridae and Pomacanthidae, and sea-snakes Hydrophiidae.